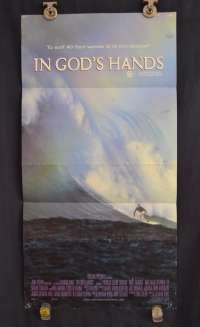 IN GOD'S HANDS is the story of three young surfers, best friends on a roller coaster action tour of the globe's most exotic and dangerous surfing spots. They travel to Madagascar, Mexico, Bali and Hawaii seeking the ultimate wave, a 40-foot force of nature at speeds up to 35 miles per hour. It will be the ultimate adrenaline rush, but they'll discover that chasing adventure this big is to put yourself IN GOD'S HANDS.